If you are running an online business, you won’t want to lose a single visitor. Who knows, that visitor might get converted into your customer? So it is a good idea to interact with those visitors in real time and convert those into customers. This can be done easily through chatting. Recently I have come across a very good chatting software CometChat which helps you to integrate the chat feature in your website easily and interact with the visitor in real time. CometChat is a unique product by InScripts, a software development company which allows you to include a chat functionality in your site to provide better user experience and to get more business. No matter where your site is hosted and which framework you are using, CometChat provides the flexibility to use their chat on your site. 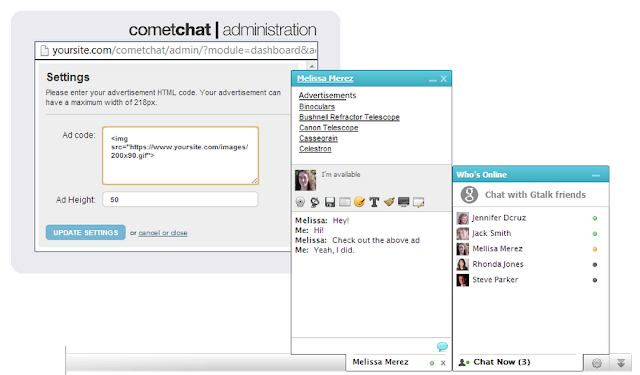 CometChat also support 9 major language and is supported by all the browsers. The best thing with CometChat is the light weight. The software can easily be integrated with any site either through plugin or through simple php & JQuery codes. 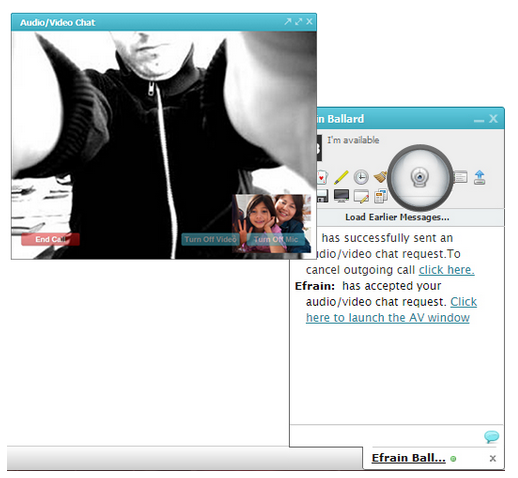 It also allows video and audio chat and also allows users to talk using their Facebook and Google accounts. CometChat is one of the best chat software currently and is used by major companies since years. Company claims to have 30,000+ customers over in 127 countries including date.com, Bharat Matrimony and many such other companies. Here are the few basic features of CometChat due to which it is very beneficial for the businesses. • It is very light and so can be run on any server with minimal server load. • It works on all the modern desktop and mobile browsers. • You can share files, share your screen with others, send text messages, handwritten messages, documents, etc. • Push notifications are available for mobile so that you never miss a message. • You can allow users to create chat rooms, ban users or kick them, delete any conversation, etc. • You can add a number of plugins to CometChat to provide audio-video chat and conference feature, multi-player games, real time translation, etc. to your website users. 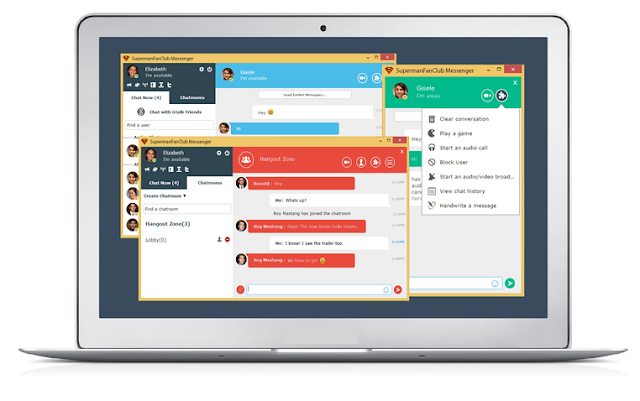 • CometChat is available for all the major operating system like Windows, Android, iOS etc. • As said above, this chat software supports 9 languages. Apart from the above characteristics, here are some of the great features provided by CometChat which helps you to increase your sales and support. Note: One of the best use of such Chat software can be this- If you are selling some products on your site then whenever any user is coming to the sales page, you can give them some kind of discount or offers. Believe me this covert like rocket. Admin panel works like a central repository where you’ll get all the information like who are chatting, which representing is working with which customers, total number of message received, and message sent and many such things. You can even monitor your associates like what they are answering and all. You can also setup chatrooms, plugins and extensions, go through the logs, set up languages and monitor stats from your admin dashboard. This is the new feature introduced by CometChat where users can interact with your executive through audio & video calls. Though this feature is only included in Platinum edition but every penny of it worth. Even users can initiate the video conference to interact with multiple users/executives. This is really a beneficial functionality as visuals impact more than text. Looking for more revenue from the same resource and effort? CometChat allows you to do so. CometChat can play a key role in generating an additional revenue on your website while entertaining your viewers. You can now add custom advertisements to the chat windows whenever you like. Ads will be displayed in the active chat box. You can easily use Google AdSense or any other HTML ad code in the chat box and can earn few extra bucks. CometChat knows that different site has different demands and needs and so CometChat comes with many themes which you can use as per your need. You’ll have the complete flexibility to select from a wide variety of docked and embeddable chat themes that lets you customize CometChat to suit your website. Also, all the themes are highly responsive and works well on both mobile and desktop. Below are some of the platforms for which they have ready to install integrations. You just need to active on these sources. Mobile chat SSK is available for iOS and Android platforms. You can also add Mobile SDK to your dashboard to receive the messages directly on your existing mobile applications. • Compatibility- Highly compatible to all devices and browsers. The professional plan comes at just $129 which is suitable for small business. 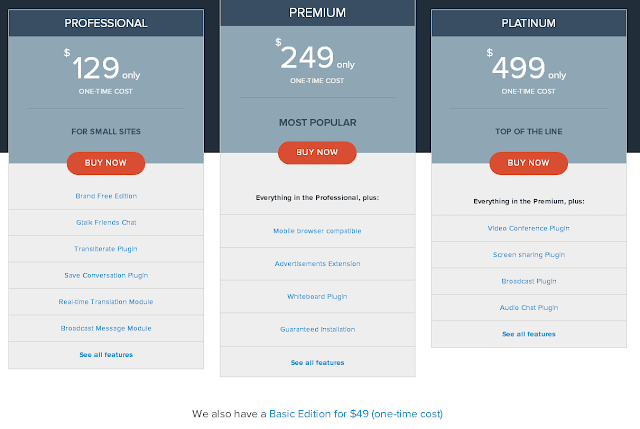 If you have mid-level business involving good number of users and employee, you can try Premium plan at $249. For large industry, they have Platinum with many extra functionality at $499. CometChat is really and a most have software for all the online business. 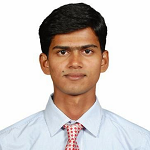 Though there are multiple such software but the features CometChat is providing is really amazing. You can also check the demo of all their features for better understanding. Which chat software you use on your site? Share your experience with us.